Be subject to one another out of reverence for Christ. Wives, be subject to your husbands, as to the Lord. For the husband is the head of the wife as Christ is the head of the church, his body, and is himself its Savior. As the church is subject to Christ, so let wives also be subject in everything to their husbands. Husbands, love your wives, as Christ loved the church and gave himself up for her, that he might sanctify her, having cleansed her by the washing of water with the word, that he might present the church to himself in splendor, without spot or wrinkle or any such thing, that she might be holy and without blemish. Even so husbands should love their wives as their own bodies. He who loves his wife loves himself. For no man ever hates his own flesh, but nourishes and cherishes it, as Christ does the church, because we are members of his body. “For this reason a man shall leave his father and mother and bejoined to his wife, and the two shall become one flesh.” This mystery is a profound one, and I am saying that it refers to Christ and the church; however, let each one of you love his wife as himself, and let the wife see that she respects her husband. I was concerned that the people who had difficulty with this passage would let it overshadow all the things that they found good and beautiful about the wedding service and about Orthodoxy in general. So I decided to write a brief letter to them to try to address some of these problems. The idea of women submitting to their husbands, and of a husband being “the head of the wife”, is admittedly not the sort of thing that you might read in most modern literature on the subject. It seems to advocate a kind of marital state in which women’s opinions are secondary to their husbands’, a situation which the women’s movement has been trying to correct for several decades now. Because it was our wedding, and because I feel strongly that the truth of this passage does not deny “women’s rights”, I want to write something about what it means to me. I am not a theologian, and my knowledge of Orthodox theology is not strong. But Jim and I were married by civil authorities thirteen years ago, so we had many years of experience as a married couple before we were married in the church. First of all, I think there are a couple of ways that you can easily dismiss the whole passage. You can simply say that it’s a matter of translation. One friend who objected to the passage told me that she had trouble with the Dutch word “onderdanig”, which sounds much stronger than the English “be subject to”. And when I looked the passage up in our biblical concordance I learned that there are several words in Greek that convey the idea of obedience and submission. The word used in this particular passage is exactly the same word that is used to convey submission to God. It is, in fact, a Greek military term meaning “to arrange [troopdivisions] in a military fashion under the command of a leader”. But in ordinary, non-military use the word was used to mean “a voluntary attitude of giving in, cooperating, assuming responsibility, and carrying a burden”. There is another word used in the Epistles which is translated in English as “submit”, but this word suggests yielding and weakness. The word in the marriage ceremony, however, does not suggest weakness; it suggests cooperation. By contrast, there are two other sections in chapter 6 in which Saint Paul discusses the obedience of children to their parents, and the obedience of slaves to their masters, and here he uses yet another word. So he chose his words carefully. He chose a word which suggests sharing burdens and cooperating, not yielding as the weaker party. We don’t have this kind of flexibility in English (or in Dutch). One might also dismiss the passage on the basis of cultural differences. After all, Saint Paul also tells slaves to obey their masters, and today we all recognize the injustice of slavery. So might we not also say that Paul’s understanding of women is as outdated as his understanding of slavery? I suppose we might, but he clearly makes a distinction between his discussion of marriage (with the different verb) and his discussion of other kinds of obedience. The key sentence is “This mystery is a profound one, and I am saying that it refers to Christ and the church.” For Paul, there was a vital link between marriage and the love of Christ for the church. He does not say that the relationship of children to parents, or slaves to masters, reflects the love of Christ for the church. It’s only in marriage. I think there are two important issues at stake here. One is the importance of freedom in Christian life. The other is the radical change that Jesus brought to hierarchical structures (although he did not eliminate them). 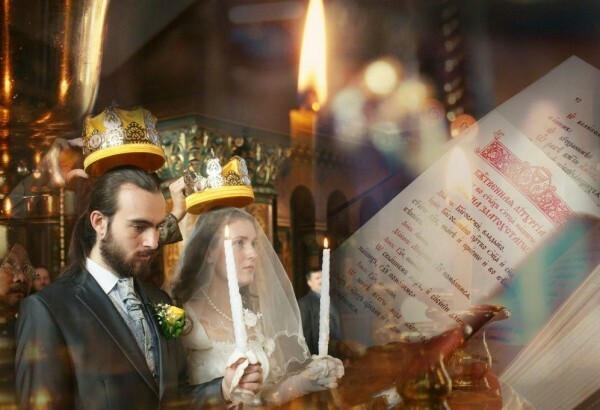 In his brief sermon after the wedding ceremony, Father Sergei Ovsiannikov talked about how essential it is that people who marry be free people. He said that in ancient times, slaves were not permitted to marry; this was a rite that was reserved for free people only. Both men and women enter into marriage out of freedom, out of a desire to submit to each other and a willingness to sacrifice their singularity and to create a new thing, a married couple, a single unit. This doesn’t mean obliterating their selves, but it implies a freely-chosen state in which there is a constant, active submission to each other. Freedom is important because it means that both men and women should struggle to make intelligent, mature, responsible decisions, to listen to each other, to have the courage to admit mistakes and to defer to their partner at times. People who are not free don’t behave like this. Women who are not free never disagree with their husbands and support them even when they are wrong. This isn’t a Christian marriage. The word “free” is an interesting one among the Indo-European languages. If you could trace it back through linguistic history to the ancient Indo-European language, the mother language of all modern Western languages, you would find some root word that is no longer spoken today. The scholarly guess is that the Indo-European root word of “free” was “pri”, which meant “to love”. In ancient English, “free” implied a relationship. It meant someone who was “dear to the chief” and who fought for the tribal chief out of allegiance and love, not for money or because of coercion. The freeman was not a conscript or a mercenary. “Free” implied sacrifice and submission as well. It didn’t mean that you were “free” of all ties, as it does today. It meant that your ties were freely chosen because of your feelings of love for the person to whom you gave your allegiance. If you trace the evolution of the Indo-European root word as it passed into other Western languages you would be surprised at what you find: all sorts of words that have to do with loving relationships: friend, “freund,” “vriend,” “vrijen,” and dozens of words in other languages, even to an Old Slavonic word “prijateli,” or friend, and the Sanskrit words “priya,” dear, and “prn” to delight or endear. So the connection between freedom and love has been deeply imbedded in our culture. With this in mind, it’s interesting to return to that Greek word which was translated as “submit”. The definition of that word is “a voluntary attitude of giving in, cooperating, assuming responsibility, and carrying a burden.” There’s the same stress on freedom and the decision of the free person to give in to the other and to help bear a burden. But to say that both husband and wife must be free people, loving people, may not satisfactorily address the problem of the husband being called the “head” of the wife, and of women being instructed to be “subject to their husbands in all things”. I think we can’t look at this problem simply from our Western, post-Enlightenment way of thinking; we can’t just insist that both the husband and the wife be regarded as separate, unique, equal individuals and leave it at that. The relationship, or the flow of love, or the dynamic that is always taking place in a marriage has to be described somehow. Several times in this passage Paul says that the marital relationship is like the love that Christ has for the Church; he says, “This mystery is a profound one, and I am saying that it refers toChrist and the church.” There is no other kind of relationship that is described in this way in the Bible — not the Platonic love between men or the love of a subject to a king or the love between mothers and children or even the love of a spiritual leader for his flock, although these all are profoundly deep forms of love. None of them “refer to Christ and the church” as marriage does. It’s almost as if Paul were saying that a married couple is an icon, a way of actually seeing the mystical truth of Christ and the church. So to say that the man is the “head” isn’t just a reference to traditional patriarchal sexist hierarchy; it’s a way of describing the structure of the marriage to reflect the mystical truth to which it refers. This doesn’t give men the license to lord it over their wives and beat them into submission; it should serve to direct the attention of the man and the woman to the relationship that serves as their model — the love between Christ and the church. So what is that model like? This, I think, is where the second issue comes in, the radical change that Jesus brought to hierarchical structures, and the question of power and submission. I’m not a New Testament scholar, and I don’t have my finger on all the particular references in the New Testament, but I do know that the whole life of Christ was the story of the Son of God humbling himself and sacrificing himself for humankind. He was born in a stable, he lived in humble circumstances, he scandalized people by associating with the lower classes, he washed his disciples’ feet under their great protest. So the model of Christ’s love for the church is one of humility and sacrifice, not one of power and control. There are many passages in the Gospel in which the relationship between Christ and the church is described in terms of a bridegroom and a bride. I’m often reminded of this during the Liturgy, because it seems to me that the whole physical structure of the church itself and the movement of the Liturgy keep pointing to this relationship. The people coming into the church bearing candles (like the story of the wise and foolish virgins waiting for the bridegroom), the priest comes out from the sanctuary bringing the bread and wine — the bridegroom — to the church, and the church comes forward to receive him. The parallel between this and marriage is profound (as Paul says) and intensely physical at the same time. I think that Paul insisted that in marriage we must understand the man as the “head” of the woman because he felt very deeply that the mystery of marriage is a real mirror of the mystery of Christ’s love for the church. In saying this, then, Paul is implying that a man’s love for his wife should be as humble, as complete, and as self-giving as Christ’s is; and in saying that women should “submit” to their husbands, Paul, in his choice of words, is implying that women should voluntarily, in freedom, consent to listen, cooperate, and bear their share of the burden of the marriage. We have to face the fact that as children of our age, passages like this one are going to be very difficult for us, Orthodox and non-Orthodox alike. Submission is not a popular attitude today. So perhaps we have to go further than studying the etymologies of the words in Paul’s epistle. Perhaps we, as women, have to examine our own reaction to being told to submit, to acknowledge someone else as our “head”. This is admittedly a very difficult thing for intelligent, educated, healthy people to do. We bristle at the very thought. In Western culture today, intelligent women are those who recognize their own individual worth; many women refuse to change their names as a way of asserting their individuality; women demand to be recognized as equal before the law. So when it is suggested that we submit to our husbands, men ought to understand what an extremely difficult thing is being asked of us. But it is being asked of us, because without our submission the icon of marriage is incomplete. When I discussed this with a friend of ours recently, a priest with a broad understanding of Islam, he reminded me that in Islam the highest thing one can aspire to is submission, that “Islam” itself means submission to God. And when we look to the Mother of God, who should be our model of the perfect response to God’s will, we see the same attitude of submission. But that’s submission to God, you say, and we’re talking about submission to husbands, to ordinary human beings. Perhaps this is where the mystery of marriage lies, and this is what Paul was talking about when he said that no other relationship bears the stamp of Christ’s love for the church. The submission of a woman to her husband is not a one-way street, because husbands are enjoined to love their wives as Christ loved the Church, that is, with the kind of sacrificial love that is full of respect and honor. There is the temptation here to see marriage as a kind of balance, with husband and wife cautiously playing their submission and sacrifice cards in an ultimate effort to protect themselves and flatter their own egos: “I’ll submit to you if you sacrifice to me”; “I’ve done something selfless for you to show you how saintly I am, and I expect something in return.” But this isn’t the way Christ loves the Church. If you enter into marriage with the idea that you’re going to struggle to protect your self, even by balancing out your acts of mutual sacrifice, you’ll never have a marriage at all. Marriage isn’t a deal. The flow of submission and sacrifice is a reflection of the flow of love among the persons of the Holy Trinity. We regard the Trinity not as three separate gods who love each other, but as one God who is Love itself. And perhaps here is the mystery: Paul is telling women to submit to their husbands, not primarily out of a sense of self (either submission as a way to enhance one’s ego or submissionas a confirmation of one’s poor self-esteem) but without a consideration of self at all. The challenge of marriage for both women and men is that the marriage must become the primary source of identity for both of them, and that the energy that holds this thing together and keeps it alive and vital is submission on the part of the wife and sacrificial love on the part of thehusband. We are often given to understand that the challenge of marriage today is for the two partners to try to maintain their own identities. But it may be that this is a very questionable goal, and that indeed just the opposite is true. The challenge of marriage today is that in the face of a culture that forces us to dwell within the fortress of our own personality, with all the exhausting protection that such an enterprise entails, we are asked to tear down the walls and build something new with someone else. The enormous comfort of St. Paul’s epistle is his assurance that in doing so we are reflecting the love of Christ himself.